Zafra is an ancient site, fortified first by the Celto-Iberians and later by the Romans. The Moors captured the area and built a great alcázar. Many of the narrow, twisting streets and whitewashed walls of today’s town reflect their influence. The present castle, commissioned by Lorenzo de Figueroa, was begun in 1437 on the foundations of an old Moorish fort and took six years to finish. His shield and that of his wife, Doña María Manuel, hang over the doorway. Through the centuries the dukes of Feria—members of one of the most noble houses of Spain—held court at the castle. One of their more notable guests was the conquistador Hernán Cortés, who lived here before setting off for the New World. Try for a room overlooking the town of Zafra (some rooms look out onto the parking lot). Go up to the turrets and parapets on the roof for a great view of Zafra. 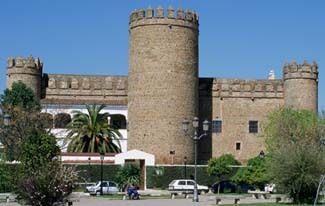 Zafra is a pleasant town and a convenient base for excursions throughout the Extremadura region. It is also a stopping-off point for an easy drive into Portugal. Open: Mid-February through October and last two weeks of December. Zafra is located off N-630 and N-432. It also can be reached by bus or train. Directions to the castle are signposted as you come into town. Step through the spectacular façade of this four-star castle hotel into a medieval world. At night, the great wooden doors creak open atmospherically, and the white marble columns surrounding an inside courtyard glow with a luminescence in the dark. Four 25-meter-high stone towers stand guard at each end of the castle, while four more keep intruders at bay at the front entrance. Another massive 30-meter-tall tower looks out to the east. Inside the castle, coffered ceilings, ironwork, large chests and other decorative details give interest to the austere stone walls. Many of the spacious guest rooms are entered through arched, carved wood doors with big iron knobs. Beds are covered with off-white spreads accented by red-and-pink pillows. Marble bathrooms are completely modernized. When the weather is fine, dining is outside in the interior patio, highlighted by a fountain in the middle and two stories of dramatic stone arches. The interior Renaissance patio was the work of Juan de Herrera, architect of El Escorial. The castle chapel features a superb gilded Gothic-Mudéjar ceiling.